THE FIRST BOOK OF LUCAN. Lucans First Booke Translated Line for Line, By Chr. Marlow. At London, the Flower de Luce in Paules Churchyard, 1600, 4to. TO HIS KIND AND TRUE FRIEND, EDWARD BLUNT. Blunt, I propose to be blunt with you, and, out of my dulness, to encounter you with a Dedication in memory of that pure elemental wit, Chr. Marlowe, whose ghost or genius is to be seen walk the Churchyard, in, at the least, three or four sheets. Methinks you should presently look wild now, and grow humorously frantic upon the taste of it. Well, lest you should, let me tell you, this spirit was sometime a familiar of your own, Lucan’s First Book translated; which, in regard of your old right in it, I have raised in the circle of your patronage. But stay now, Edward: if I mistake not, you are to accommodate yourself with some few instructions, touching the property of a patron, that you are not yet possessed of; and to study them for your better grace, as our gallants do fashions. First, you must be proud, and think you have merit enough in you, though you are ne’er so empty; then, when I bring you the book, take physic, and keep state; assign me a time by your man to come again; and, afore the day, be sure to have changed your lodging; in the meantime sleep little, and sweat with the invention of some pitiful dry jest or two, which you may happen to utter with some little, or not at all, marking of your friends, when you have found a place for them to come in at; or, if by chance something has dropped from you worth the taking up, weary all that come to you with the often repetition of it; censure, scornfully enough, and somewhat like a traveller; commend nothing, lest you discredit your (that which you would seem to have) judgment. These things, if you can mould yourself to them, Ned, I make no question that they will not become you. One special virtue in our patrons of these days I have promised myself you shall fit excellently, which is, to give nothing; yes, thy love I will challenge as my peculiar object, both in this, and, I hope, many more succeeding offices. Farewell: I affect not the world should measure my thoughts to thee by a scale of this nature: leave to think good of me when I fall from thee. Hath made barbarians drunk with Latin blood? Will ye wage war, for which you shall not triumph? Might they have won whom civil broils have slain! And they of Nilus’ mouth, if there live any. Against thyself: as yet thou wants not foes. These plagues arise from wreak of civil power. And Carthage souls be glutted with our bloods! And cruel field near burning Ætna fought! What god it please thee be, or where to sway. Whence thou shouldst view thy Rome with squinting beams. There, Cæsar, mayst thou shine, and no cloud dim thee. And bolt the brazen gates with bars of iron. Thy power inspires the Muse that sings this war. Rome was so great it could not bear itself. By land and sea, no foreign force could ruin. Thyself thus shiver’d out to three men’s shares! Dire league of partners in a kingdom last not. Why join you force to share the world betwixt you? A town with one poor church set them at odds. His loss made way for Roman outrages. Being conquer’d, we are plagu’d with civil war. And all bands of that death-presaging alliànce. These captains emulous of each other’s glory. The gods abetted, Cato lik’d the other. Falls, and returns, and shivers where it lights. Was even the same that wrecks all great dominions. Was stretched unto the fields of hinds unknown. Faith’s breach, and hence came war, to most men welcome. And staring, thus bespoke: “What mean’st thou, Cæsar? And faintness numb’d his steps there on the brink. Rome’s mighty walls, built on Tarpeian rock! My thoughts sole goddess, aid mine enterprise! Cæsar is thine, so please it thee, thy soldier. Sticks in his side, yet runs upon the hunter. The bounds of Italy from Cisalpine France. And frozen Alps thaw’d with resolving winds. Which being broke, the foot had easy passage. “An end of peace; here end polluted laws! Hence leagues and covenants! Fortune, thee I follow! And some dim stars, he Ariminum enter’d. I know not, but the cloudy air did frown. Of trumpets’ clang, shrill cornets, whistling fifes. With ugly teeth of black rust foully scarr’d. “O walls unfortunate, too near to France! Waggons or tents, than in this frontier town. And labouring to approve his quarrel good. Could tune the people to the nobles’ mind. Where men are ready lingering ever hurts. May bring her down, and with her all the world. Was so incens’d as are Elean steeds. Souse down the walls, and make a passage forth. Woods turn’d to ships; both land and sea against us. When, coming conqueror, Rome afflicts me thus? Babbling Marcellus, Cato whom fools reverence! (Whom from his youth he brib’d), needs make him king? And, having once got head, still shall he reign? And laws assail’d, and arm’d men in the senate? To exceed his master, that arch-traitor Sylla. Jaws flesh[ed] with blood continue murderous. Speak, when shall this thy long-usurped power end? At last learn, wretch, to leave thy monarchy! And so they triumph, be’t with whom ye will. Whither now shall these old bloodless souls repair? Than pirates of Sicilia? they had houses. Spread, spread these flags that ten years’ space have conquer’d! We grieve at this thy patience and delay. These purple grooms, that senate’s tyranny? Is conquest got by civil war so heinous? Or Scythia, or hot Libya’s thirsty sands. And swept the foaming breast of Arctic Rhene. This hand, albeit unwilling, should perform it? And in all quarters musters men for Rome. Bloody like Dian, whom the Scythians serve. Sit safe at home and chant sweet poesy. And shame to spare life which being lost is won. Leaving your country open to the spoil. He garrison’d; and Italy he fill’d with soldiers. He looking on, by these men should be sack’d. And, without ground, fear’d what themselves had feign’d. Left hateful war decreed to both the consuls. Or, dropping-ripe, ready to fall with ruin. To their afflictions were t’ abandon Rome. Th’ irrevocable people fly in troops. Left as a prey, now Cæsar doth approach. Would make them sleep securely in their tents. Well might these fear, when Pompey feared and fled. Filled both the earth and seas with prodigies. Mycenæ, Phœbus flying through the east. Her burning head on bending Hespery. Coal-black Charybdis whirled a sea of blood. Rose, like the Theban brothers’ funeral fire. Shook the old snow from off their trembling laps. Leaving the woods, lodge in the streets of Rome. Curling their bloody locks, howl dreadful things. Shrill voices schright; and ghosts encounter men. He had before look’d Pluto in the face. His grave broke open, did affright the boors. The hearts of beasts, and flight of wandering fowls. And Flamens last, with net-work woollen veils. The quick priest pulled him on his knees, and slew him. Instead of red blood, wallow’d venomous gore. Dead and discolour’d, th’ other lean and thin. Involving all, did Arruns darkly sing. Are near some plague. What mischief shall ensue? Become intemperate? shall the earth be barren? Shall water be congeal’d and turn’d to ice? And in the fleeting sea the earth be drench’d. And fir’st his cleys: why art thou thus enrag’d? Alter their course, and vainly dim their virtue? The quivering Romans; but worse things affright them. Philippi plains. Phœbus, what rage is this? Why grapples Rome, and makes war, having no foes? Pyrene; and so back to Rome again. See, impious war defiles the senate-house! This said, being tir’d with fury, she sunk down. Old ed. “launcht.”—The forms “lanch” and “lance” are used indifferently. “So old ed. in some copies which had been corrected at press; other copies ‘Aezean.'”—Dyce. Old ed. “Eleius.” It is hardly possible to suppose (as Dyce suggests) that Marlowe took the adjective “Eleus” for a substantive. “Immineat foribus.” “Souse” is a north-country word meaning to bang or dash. It is also applied to the swooping-down of a hawk. “Unless we understand this in the sense of—say I receive no reward (—and in Fletcher’s Woman-Hater, ‘merit’ means—derive profit, B. and F.’s Works, i. 91, ed. Dyce,—), it is a wrong translation of ‘mihi si merces erepta laborum est.'”—Dyce. 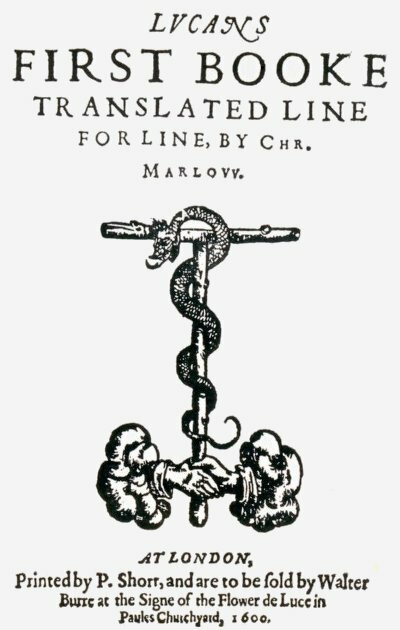 Dyce conjectures that Marlowe’s copy read Lingones. Marlowe seems to have read here very ridiculously, “gaudetque amato [instead of amoto] Santonus hoste.”—Dyce. Marlowe has converted the name of a tribe into that of a country. Marlowe has mistaken “Sarmata,” a Sarmatian, for the country Sarmatia. The old ed. gives “fell Mercury (Joue),” and in the next line “where it seems.” “Jove” written, as a correction, in the MS. above “it” was supposed by the printer to belong to the previous line. “Parts” must be pronounced as a dissyllable. The original has, “jugis nutantibus.” Dyce reads “tops,”—an emendation against which Cunningham loudly protests. “Laps” is certainly more emphatic. The line is imperfect. We should have expected “at night wild beasts were seen” (“silvisque feras sub nocte relictis”). “Or Lunæ”—marginal note in old ed. “Numerisque moventibus astra.”—The word “planeting” was, I suppose, coined by Marlowe. I have never met it elsewhere. The original has “Aquarius.”—Ganymede was changed into the sign Aquarius: see Hyginus’ Poeticon Astron. II. 29. This is the only early edition. The title-page of the 1600 4to. of Hero and Leander has the words, “Whereunto is added the first booke of Lucan;” but the two pieces are not found in conjunction.